Use the form below to inquire about Chic Mountain Resort at Kasol . Use the form below to reserve for Chic Mountain Resort at Kasol . Enjoy adventure activities as you rejuvenate in luxury at this Chic Mountain Resort at Kasol in the Himalayan foothills. Kasol is a fairy tale land with beautiful villages at every twist and turn of the road. 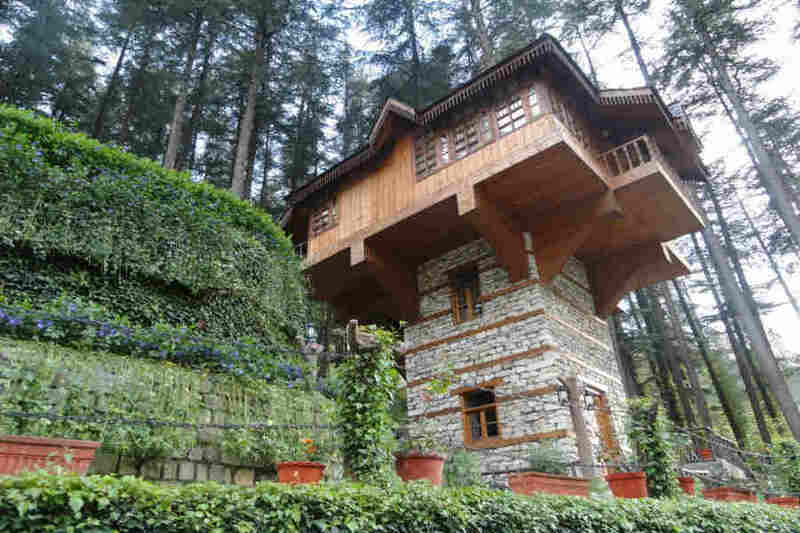 This Chic Mountain Resort at Kasol is nestled in a serene valley village. The sparkling Parvati river, hot water springs, lush valley, mud and stone houses, pine forests, apple orchards, waterfalls, enchanting flower valleys, Buddhist monasteries, and the warm locals make this region a great destination for travelers. Apart from adventure activities such as skiing, trekking, white water rafting, and paragliding, the Parvati valley is a popular pilgrimage destination. At this Chic Mountain Resort at Kasol, with the crystal clear Parvathi River gushing below, local architecture blends smoothly with world class hospitality and luxuries. The exterior is an example of the traditional Kathkunia style of architecture where stones are stacked to form the wall and held together with mud plastering on the inside. The stunning stone structure is set off beautifully by the deodar wood work, carved teak furniture, handmade silk curtains, and traditional brass fixtures. There is a spa which offers sauna, Jacuzzi, aroma therapy, acupressure, and massages. The different restaurants featuring authentic Himalayan décor offer a wide range of delicacies as well as spectacular views of the outdoors. This Chic Mountain Resort at Kasol has six cottages and two Machans for you to choose from with each room decorated according to a different theme. The cottages come with private sit-outs while the sought after Machans offer bird’s eye vistas of the scenic landscape. All cottages are furnished with a king size bed, sofa, mini fridge, mini bar, and access to a personal lawn. You can end the day with some entertaining local folk dances or a barbecue under the starry night sky. Just what you need to get the creative juices flowing or ensuring a memorable vacation for the whole family! Transport charges other than pick up and drop to airport /bus stand. Lunch and other personal expense like liquor, tips etc. Charges for in-room safes, rollaway beds, and cribs, plus applicable taxes, are not included in the package. Gratuities, laundry, telephone calls, meals, beverages, sightseeing or any other incidentals at the hotel are the responsibility of the guest. 6-14 years -20% of the package cost without extra bed. Between 30 and 7 days 30% deduction. If you do not want to step out of the comfort of your cozy abode in the Himalayas, try the Jacuzzi, aroma therapy, or spa with heat sauna. Follow these up with acupressure or massages to make you as good as new. You can enjoy a game of billiards or drink in the views with a warm beverage in hand. As for those seeking outdoor adventures, rock climbing, rappelling, mountain biking, and rafting are sure to keep you busy all day long. All safety measures have been put in place so that even the faintest of heart can participate in these activities. The jungle barbeque is a memorable experience as is angling in the Parvati River. Trekking trails abound and you can choose to see the mountains up close with this opportunity. An open jeep safari is yet another way of wondering at the beauty of the Himalayan peaks. Paragliding high above the valley as you enjoy stunning vistas of the majestic Himalayas is an experience to be cherished forever. You can also choose Agri tourism where you can visit the fruit orchards and help out with various tasks such as picking fruits to eat later. Nearest airport to Kasol is Bhuntar Airport at a distance of 32 km. Dharamshala airport is at 220 km and Shimla airport is 237 km away. Indira Gandhi International Airport is 534 km away. Joginder Nagar rail way station is the closest at 144 km. with Chauntra Bhater railway station just 154 km away. New Delhi railway station is 528 km away. Manikaran is 5 km from Kasol via Manikaran Road while Kullu is at a distance of 37 km. Manali is about 73 km away via Manikaran Road and NH3 while Delhi is about 534 km away via the Delhi-Jammu road.